If you are a parent who is thinking of ways to keep your child active, you may want to enroll your child to a dancing lesson. There are some children who may not be athletic or sports-minded, rather than forcing them to join sports activities that do not interest them , try dancing lessons with them. Dancing is a great physical activity; it requires a lot of movement. The good thing about dancing, children can learn to be graceful and well coordinated. Dancing to the beat of the music can also help their minds relax. This is a good outlet to keep them physically fit and have a sound mind. Ballet, ballroom dancing, jazz and interpretative dancing, as well as hip-hop dancing can work up those triceps and biceps. Especially when you see these young kids do the cartwheels, jumps, splits, tumbling to the beat of hip-hop music. They can really work out a sweat or more. Another advantage of dancing lessons is that it helps them be creative and be part of the performing arts. Cultural dancing helps kids learn about different cultures other than their own, like Hawaiian, Mexican, Filipino, Japanese, Chinese, etc. Every culture has its own dance. So learning their dances can help children understand their history and culture. Another way that dance lessons help children is that when they have talent shows in their community and schools, they can participate and show their talents; it is a good way to help build their self-confidence. And if there are gatherings, they can dance proudly with the crowd. 1) Physical Activity: As explained above, dancing lessons are a good way to keep your child physically active. 2) Develop Talent: Your child or you may not know it, but your child may have a talent for dancing and formally enrolling to a dance lesson can help further enhance or develop this talent. 3) ) Creativity and Appreciation of the Arts: Children learn to explore and be creative with each step they learn from a dancing class or school. 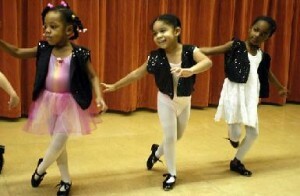 Since dancing is an art form, your child will appreciate it more if he or she takes lessons. 4) Socialization with Group of Peers: If you enroll your child to a dance lesson with a certain number of students, your child can socialize with others who share the same interest in dancing. 5) Build Self Confidence: Dancing lessons would lead to public performances which can further develop your child’s self confidence. 6) Graceful Movement with Body Coordination: Children learn to be graceful with dance lessons, and can enhance their body coordination. 7) Cultural Awareness: Children learning folk dances of each culture, not only their own, would learn each country’s culture. So next time you are thinking of a physical activity for your child, think of dancing. It’s a great way to keep your child healthy and fit!